INTRODUCTION: Childhood obesity disproportionately affects rural populations; therefore, promoting healthy eating among rural children is essential. Teachers are important role models for children and can influence children's eating behaviors through their own behaviors and beliefs about food. This study examined the food-related practices and beliefs of rural elementary and middle school teachers. METHODS: Data were used from the SNACZ study, a school- and community-based trial conducted in rural Oregon. Kindergarten through eighth-grade teachers (n=87), teaching students usually aged 5-14 years, from eight rural school districts completed a baseline survey in November 2012 concerning their classroom food practices, eating behaviors at school, beliefs about the school food environment, and nutrition knowledge. Frequencies of responses to each item were calculated. RESULTS: Nearly all teachers (97.6%) agreed that a healthy school food environment is important, but fewer agreed that teachers' behaviors and the foods available at school influence students' eating behaviors (71.0% and 67.0%, respectively). Nearly 86% of teachers used candy as a reward for students, while 78.2% consumed unhealthy snacks and 42.5% consumed sweetened beverages in the classroom. CONCLUSIONS: The results suggest that most rural teachers recognize that having a healthy school food environment is important, but are less aware of factors within the school that influence students' eating behaviors - including their own eating behaviors and classroom food practices - and, perhaps for this reason, many rural teachers engage in classroom practices and behaviors that do not promote healthy eating. Teacher training and expanded school policies that focus on teacher behavior may be needed to ensure a healthier rural school food environment. Findholt, N. E., Izumi, B. T., Shannon, J., Nguyen, T., Shannon, N. F. B. I. J., & Nguyen, T. (2016). 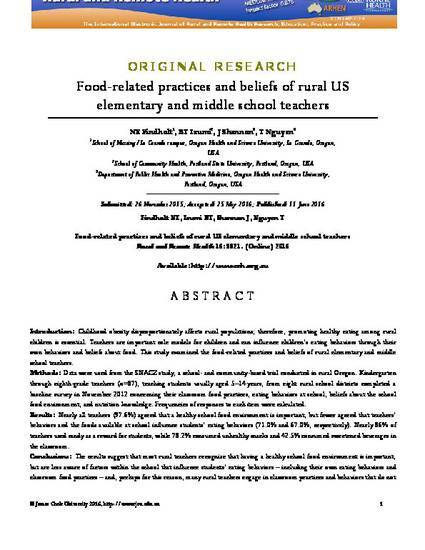 Food-related practices and beliefs of rural US elementary and middle school teachers. Rural and Remote Health, 16(3821).